Fitbit (NYSE:FIT), the leading global wearables brand, today revealed a resting heart rate analysis on its global users over the last 18 months.i The company analyzed a representative sample of aggregated and anonymized average data of millions of global Fitbit users with PurePulse® heart rate tracking devices, including Fitbit Alta HR™, Fitbit Charge 2™, Fitbit Blaze™ and Fitbit Ionic™. 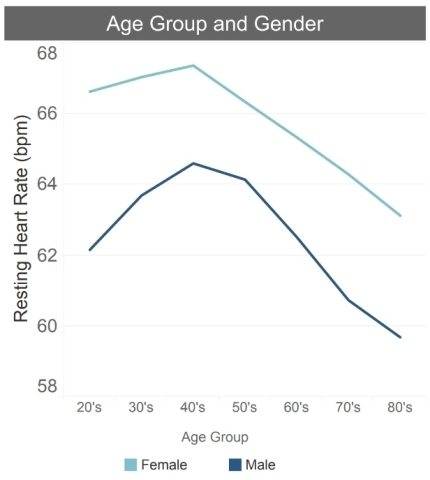 Key findings revealed that resting heart rate decreases after age 40, women tend to have a higher average resting heart rate than men, and Fitbit users in the United States and Singapore had the highest average resting heart rate compared to users worldwide. With more than 108 billion hours of heart rate data tracked since introducing the first continuous day and night, wrist-based heart rate tracking wearable device in 2014iii and with more than 25 million active users, Fitbit has one of the most extensive, longitudinal databases on heart rate metrics in the world. This data uniquely positions Fitbit to identify heart rate trends across millions of global users, providing insights and opening the possibility for additional research at a larger scale that may have been previously unavailable to medical researchers and healthcare professionals. Fitbit also evaluated the average resting heart rate among users in 15 countries. The analysis found users in the United States and Singapore had the highest average RHR at 65.9 BPM. Users in Italy had the lowest average RHR at 61.8 BPM (see Table 2). February marks Heart Health Month, a time to raise awareness on maintaining heart health. Exercising more often, losing weight if necessary, reducing stress, and avoiding tobacco products can help decrease resting heart rate.iv Wearing a Fitbit device with PurePulse to track heart rate continuously while at rest and during sleep, and seeing trends in the Fitbit app can help determine if lifestyle changes may have a positive or negative effect on heart health. Regularly engage in moderate to vigorous aerobic activities like brisk walking, biking or swimming to help the heart become more efficient at pumping blood, plus you might lose weight which can lower resting heart rate over time. If you notice an increase in resting heart rate while going heavy on training but light on the rest, your body may be telling you to scale back. Chronic sleep deprivation—which can lead to fatigue, a lower metabolism, and extra snacking—can also raise your resting heart rate. Aim for at least seven hours of sleep each night. Keep track of your heart rate data to gauge what is normal or abnormal for you. Knowing your data can be one of the first steps to gauging whether to seek professional medical attention. Additional heart health tips from Harley can be found on the Fitbit blog here. Fitbit helps people lead healthier, more active lives by empowering them with data, inspiration and guidance to reach their goals. As the leading global wearables brand, Fitbit designs products and experiences that track and provide motivation for everyday health and fitness. Fitbit’s diverse line of innovative and popular products includes Fitbit Surge®, Fitbit Blaze®, Fitbit Charge 2®, Fitbit Alta HR™, Fitbit Alta®, Fitbit Flex 2®, Fitbit One® and Fitbit Zip® activity trackers, as well as the Fitbit Ionic™ smartwatch, Fitbit Flyer™ wireless headphones and Fitbit Aria 2™ Wi-Fi Smart Scale. Fitbit products are carried in 46,000 retail stores across 78 countries around the globe. Powered by one of the world’s largest social fitness networks and databases of health and fitness data, the Fitbit platform delivers personalized experiences, insights and guidance through leading software and interactive tools, including the Fitbit and Fitbit Coach apps, and the Fitbit OS for smartwatches. Fitbit Health Solutions develops health and wellness solutions designed to help increase engagement, improve health outcomes, and drive a positive return for employers, health plans and health systems. Data Source: Fitbit analyzed a representative sampling of aggregated and anonymized average data of about 4 million global Fitbit users from July 1, 2016-December 31, 2017.
i Fitbit analyzed a representative sampling of aggregated and anonymized average data of about 4 million global Fitbit users from July 1, 2016-December 31, 2017.
iii Fitbit database metric as of December 31, 2017.
iv Nauman et al., 2011. Temporal changes in resting heart rate and deaths from ischemic heart disease. JAMA, 306; 2579-2587.